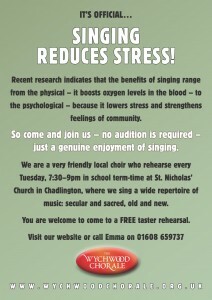 We are a very friendly local choir who rehearse every Tuesday, 7:30–9pm in school term-time at St. Nicholas’ Church in Chadlington, where we sing a wide repertoire of music: secular and sacred, old and new. You are welcome to come to a FREE taster rehearsal. Visit our website or call Emma on 01608 659737.